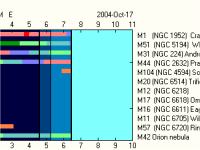 Most of the timetables show the visibility of one object, or a number of planets, over many nights. Lists allow for the visibility of many objects to be shown for a single night. This can be useful in planning an observing session so that objects which set early can be observed first, for example. 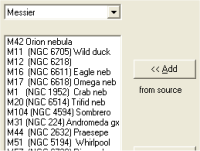 Different lists can be built by selecting existing objects from the database.